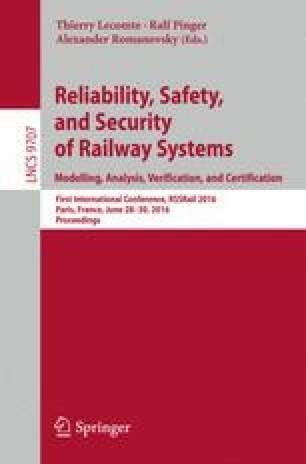 This paper presents a formal analysis of the train to trackside communication protocols used in the European Railway Traffic Management System (ERTMS) standard, and in particular the EuroRadio protocol. This protocol is used to secure important commands sent between train and trackside, such as movement authority and emergency stop messages. We perform our analysis using the applied pi-calculus and the ProVerif tool. This provides a powerful and expressive framework for protocol analysis and allows to check a wide range of security properties based on checking correspondence assertions. We show how it is possible to model the protocol’s counter-style timestamps in this framework. We define ProVerif assertions that allow us to check for secrecy of long and short term keys, authenticity of entities, message insertion, deletion, replay and reordering. We find that the protocol provides most of these security features, however it allows undetectable message deletion and the forging of emergency messages. We discuss the relevance of these results and make recommendations to further enhance the security of ERTMS. We would like to thank Maria Vigliotti and Florent Pepin from the UK’s Rail Safety and Standards Board (RSSB) for helpful discussion regarding the security of ERTMS. Funding for this paper was provided by the UK’s Centre for the Protection of National Infrastructure (CPNI) and Engineering and Physical Sciences Research Council (EPSRC) via the SCEPTICS: A SystematiC Evaluation Process for Threats to Industrial Control Systems project.